four − = two Required Please enter the correct value. Our 2015 top stock picks still feature chipmaker Ambarella Inc. (Nasdaq: AMBA) stock, even though it was a target of noted short seller firm Citron Research this past week. In a rather nasty short report, Citron was skeptical of AMBA stock's rise since its October 2012 IPO priced at $6. Since then it has risen more than 2,000%. 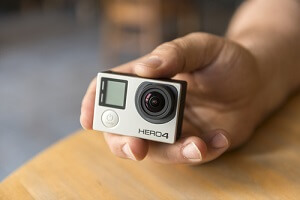 Among the criticisms was that as a chipmaker for GoPro Inc. (Nasdaq: GPRO) Hero cameras, AMBA's valuation reflected overhype. "This chip designer isn't disrupting an industry or defining a new marketplace. Wall Street's love affair with Ambarella unjustifiably started with the IPO of GoPro," Citron wrote. "Citron has seen this movie too many times, and when the shine comes off investors will be looking at a chip company that will trade at the same valuation multiple of its peers – which in this case put the stock at $30." The short report sparked a wave of panicked selling. From its closing highs of $126.70 last Thursday, it fell all the way to $94.36 – a 25% plunge – by Monday. Money Morning Defense & Tech Specialist and long-term AMBA stock bull Michael A. Robinson called this "classic panic selling based on nothing more than a short seller's opinion," and was undeterred by this recent AMBA stock price drop. "Ambarella still faces a lot of growth in the years ahead," Robinson said. "After this fairly hefty 'haircut,' the stock should resume its upward trajectory." And since then it has. It's back up 11% since that drop. And it's still up 106.5% this year. Since Robinson first recommended AMBA stock back on Aug. 2, 2013, it's had a peak gain of 590.1%. AMBA stock has long-term growth potential in exciting markets. Its chips will be used in action cameras, unmanned aerial vehicles, backup cameras in connected cars, surveillance cameras, and Ultra-High Definition televisions. As Robinson said, it has "sterling financials." The firm reported stellar first-quarter results, with sales up 73.5%, per-share earnings up 229%, and cash on hand up 51%. AMBA stock is still among the top tech stocks to buy now, and this one short report doesn't change that.